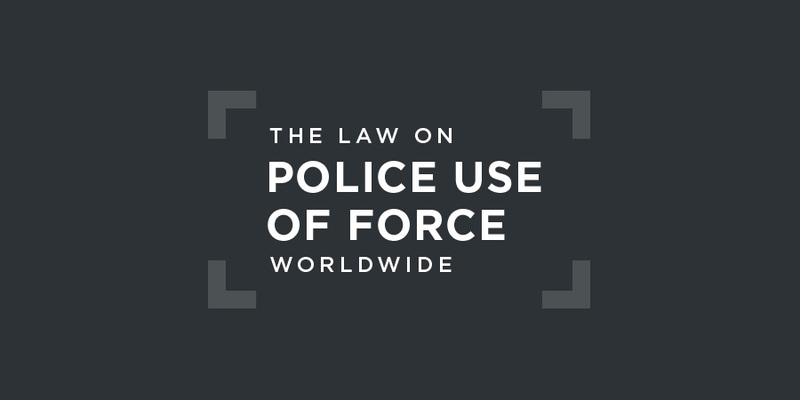 Jamaica should adopt national legislation governing police use of force, especially regarding use of firearms and the investigation of police shootings. freedoms".Chap. 3, 1962 Constitution of Jamaica.These include the rights to life; to personal liberty; and to freedom from inhuman treatment. The enjoyment of these rights and freedoms is, however, "subject to respect for the rights and freedoms of others and for the public interest". In the public interest, individual rights may be also suspended in the event of war or other calamity. Any person who believes that his rights are being violated or threatened may apply to court for redress.Chap. 3, 1962 Constitution of Jamaica. The Constitution does not establish the Jamaica Constabulary Force, though it does provide for a Police Service Commission with responsibility for the appointment, dismissal, and disciplinary control of police officers.Chap. 9, 1962 Constitution of Jamaica. All members are required to exercise care in the handling and use of firearms, and one should resort to the use of a firearm only when it is extremely necessary. Consideration must be given to the human life at the other end, and any member who has to use a firearm to injure or kill another human being must be prepared to prove that it was his last alternative, at the time of discharging such firearm.1988 Book of Rules for the Guidance and General Direction of the Jamaica Constabulary Force, §2.16. The Book of Rules further stipulates that if any member of the JCF "has to resort to the use of firearm in apprehending a criminal, or suspect, this should be done only in self-defence".1988 Book of Rules for the Guidance and General Direction of the Jamaica Constabulary Force, §2.17. This is most evident in the shift away from routine use of M16 Assault Rifles and Carbines in street level policing to the lighter and less lethal MP5 Sub-Machine Guns and Glock Pistols. The re-introduction of pepper spray with the stated intention to equip 6,000 front-line personnel with a combination of less lethal options to the use of deadly force, are all part of a process being undertaken with the ultimate aim of building a response capability that can counter violence directed at front-line personnel by civilians, while at the same time, reduce or prevent injury and death of attackers as well as bystanders. verbalize an assurance to an attacker that disarming is in both the officer’s and attacker’s own safety. Consideration was also being given to the possibility of allowing the firing of warning shots, which had been prohibited in the existing policy. The independent police oversight body in Jamaica is the Independent Commission of Investigations (INDECOM). The work of the Commission is governed by the 2010 INDECOM Act. INDECOM has stated that a central aim of its work is "to effect change" in the Jamaica Constabulary Force (JCF)’s "excessive use of force", and thereby to reduce "infringements upon the citizens right to life". In 2013, fatal shootings reached 258, while the years 2014-16 "saw a significant and welcome downturn in police-related deaths, exceeding a 50% reduction". In contrast, fatal shootings by JCF officers in 2017 recorded a 51% increase over 2016 and a 66% increase over 2015. In its 2016 Concluding Observations on Jamaica, the Human Rights Committee stated that it was concerned "at reports of torture and ill-treatment or excessive use of force by the police or security forces during arrests, in police stations, during interrogation and in detention facilities".Human Rights Committee, Concluding Observations on Jamaica, UN doc. CCPR/C/JAM/CO/4, 22 November 2016, §33. A great number of these deaths occur in circumstances consistent with extrajudicial executions at the hands of police officers. ... Civil society sources report that victims are often young men or boys from the inner cities who are unarmed and pose no threat to police. The IACHR has been informed that police use measures of excessive force and arbitrary arrest and detention, further aggravating an atmosphere of fear and victimization among the population.IACHR Report on the Situation of Human Rights in Jamaica (2013), §43. I have come to the clear conclusion that on a true and proper construction of the Act, INDECOM, the 1st respondent and his investigative staff have no power to arrest, charge or prosecute. Indeed, the right to do so having been neither expressly nor impliedly authorised by the Act can be taken as having been forbidden. I have also concluded that the provisions in the Act are clear and unambiguous and need no assistance from parliamentary debates in resolving any ambiguity. I have also concluded that the 1st respondent and his investigative staff have no power to arrest, charge and prosecute by statute or at common law as private citizens. Indeed, in my view, it would be absurd and contrary to Parliament‟s intention for the 1st respondent and his investigative staff to be given vast powers under the Act to investigate and then utilise their rights as private citizens to arrest charge and prosecute.Court of Appeal, Police Federation v. INDECOM (2018) §185. The other two honourable justices, however, declared by Order of the Court (Phillips JA dissenting) that statute had not abrogated the common law right of INDECOM and their staff, "in their respective private capacities, to initiate a private prosecution against any person" for criminal offences covered by the relevant statute, nor their common law right "to arrest or charge any person or initiate a private prosecution against any person for any criminal offence". As of writing, INDECOM was seeking leave to appeal to the Privy Council on the order that it did not have the requisite statutory authority to arrest, charge, and prosecute members of the security forces.